PACS thanks our sponsors, supporters, contributors, volunteers and guests. We especially want to acknowledge the generous donations from these organizations, artisans and individuals. We owe our success to you! a simple meal of soup and bread to help fight hunger in our community. Dine in and take out available - Please no alcohol at this event! Bowls are hand crafted by area artists and students. Keep your bowl as a reminder of the need to end hunger. Online registration will close at 11:59 p.m. on Thursday, November 1st. If tickets are still available, they will be sold at the door. If you wish to pay by check, please call PACS at (610) 933-1105 x 214.
help end hunger and food insecurity. In 1980, a high school art teacher in Michigan helped his students search for a way to raise funds to support a food drive to feed hungery residents of their community. What evolved was a class project with students crafting ceramic bowls for a fund raising meal. Guests were served simple fare - soup and bread. They kept their bowls as a reminder of hunger in their midst and throughout the world. The Phoenixville area's tradition with Empty Bowls began in November, 2007. The Holck family, owners of Artisans Gallery & Cafe, planned and hosted the event. 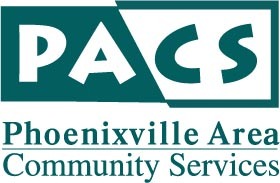 Phoenixville Area Community Services (PACS) was the charity chosen to benefit from funds raised. The first year's event was a huge success in turnout of supporters and in funds contributed to fight hunger locally. Buth the added value has been the enourmous enthusiasm of Empty Bowls' participants and donors. Earch year since 2007, the number of sponsors, supporters and contributors has grown as has the list of professional and budding artists that craft the bowls. Popular pottery workshops ........ An estimated 600 donated bowls are estimated for the 2017 event! What an amazing outpouring of caring from all of our partners and supporters. We couldn't do it without all of you. 959 unique individuals in 415 households received food from PACS in fiscal year 2017-2018. Over 10% of our neighbors who need food are seniors, and children make up nearly 30%. No one in our community should go hungry, especially not our children or senior citizens! Thanks to generous donors, PACS' emergency pantry also supplies the hungry with toiletries, paper products, diapers and other essential supplies. Thank you for helping us feed our neighbors in need and allowing us to provide them with resources, referrals and encouragment as they work to get back on their feet. Your support of Empty Bowls and PACS makes a meaningful difference, not just in providing essential food and supplies, but in giving people hope. Proceeds benefit the charitable mission of Phoenixville Area Community Services (PACS), a 501(c)(3) agency. Our mission - Phoenixville Area Community Services strives to end poverty in our community by connecting people in need with resources for food security, financial stability and better health. The official registration and financial information of Phoenixville Area Community Services may be obtained from the Pennsylvania Department of State by calling toll-free, within Pennsylvania, 1-800-732-0999.